OK, easy riders, now that you're aging, perhaps you'd like a motorcycle that balances itself AND follows you around like a puppy? Well, maybe not, but check out the Honda Assist-e self-balancing cycle. Honda’s self-balancing technology, which apparently is derived from its ASIMO robot and its self-balancing scooter called the UNI-CUB, only operates at very low speeds. 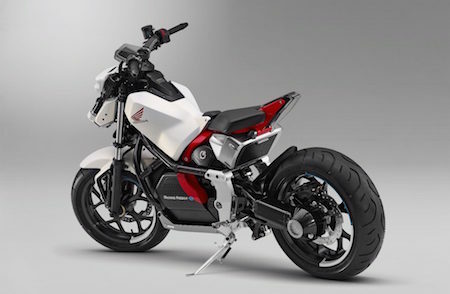 At higher speeds, you would want to be able to lean the bike into the turns and any self-balancing technologies are no longer needed unless it would aid in crash prevention. Honda Riding Assist technology does not use traditional gyroscopes for its self-balance since they tend to add a lot of weight. Instead, Honda’s system uses minute steering movements to balance the motorbike. BTW, you'll love this real-world precursor to the Honda Assist-e; allow me to present the Ghostrider Robot (2004).